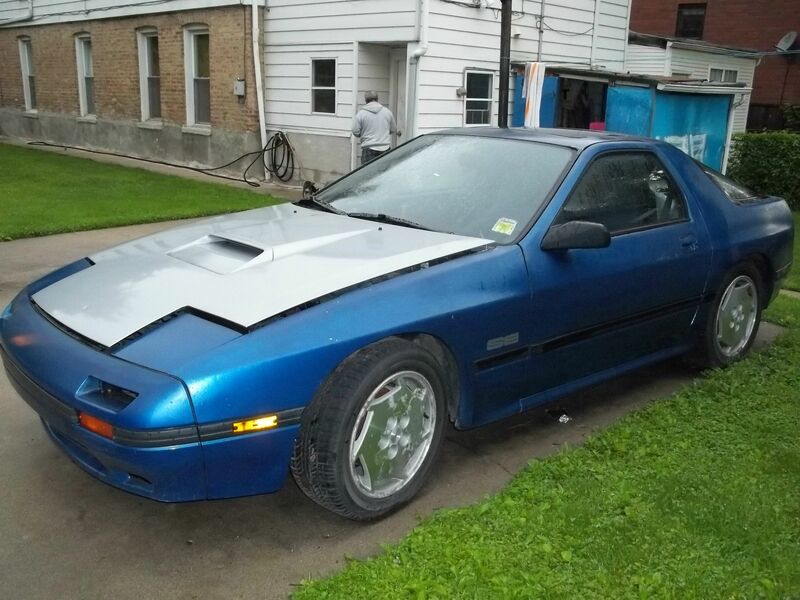 I have a partially rebuilt, partially gutted 1987-1988 Rx-7 Turbo in Chicago for sale. I had originally bought a Turbo Rx-7 from Detroit back in 2003 or so, drove it back to Chicago area and promptly started gutting it with friend's help in order to rebuild it. The mechanical drive train was in good shape, but the body was in typical North American condition. A year later I found a very clean chassis in a non-Turbo model in North Carolina, flew down there and managed to drive it back to Chicago. Gutted it as well and started doing a chassis swap, including the aluminum hood. It's been garage-kept since. With the 5-speed/trans and 5-lug aluminum wheels swapped, I installed a brand new MazdaTrix (or was it MazdaSpeed) Turbo-back exhaust and brand new suspension. I had also purchased a rebuild kit for the engine, Haltech E6K and new fuel injectors, electric fan, as well a lots of other new **** I can't recall right now, possibly a new/used turbocharger. At some point into the project other things got in the way and it stayed in the garage with some of the engine in the basement, ready to be cleaned and rebuild. I think the engine is now mostly missing or in a relatively sad state. I've now moved to NYC and it's been 5 years since I've even looked at the car -- so I just want to get rid of it cheap to the right person. I can't even find the title right now (it might be in the car's glove box). You would have to come out to Wicker Park 'hood in Chicago and take a look at it in my garage to asses what's there and give me an offer. I promise that this will be well worth your effort if you are a car geek. I have very few pictures I can share and feel free to ask any questions. Last edited by seva; 04-09-2015 at 12:25 PM.